Personality: Thalia can be known to have a couple different personalities based on where you meet the girl. Generally you will run into her in one of three cases. The first being when the girl is out pro-bending, which is better known as her normal personality. This is who she truly is. The second circumstance is when she’s in costume. Thalia is a magician, and will often be seen running around in that form in order to draw attention away from other things. The third way you may run into the girl is when she’s dealing with the gang. When Thalia is with her gang, you had better turn the other way, because it’s not going to be pretty. If you ever could pick a time to meet Thalia, it’ll be when the girl is walking the streets with an everyday casual appearance of all other citizens of Republic City. When this is the case you’ll know you’re meeting the pro-bender of the Red Panda’s team, and the normal girl. Thalia is a very reliable girl. If she makes a promise, she’ll be there no matter what. She’s always being encouraging to her teammates and is very optimistic when it comes to situations. When she’s meeting people on the streets, she loves to be friendly with them. She’s very sweet and charming, and always has a smile on her face. This is the only time she ever gets to be herself. The girl is also very imaginative, so even when she’s alone, she’s used to finding things to entertain herself. One of her favorite things to do is to help brighten the street kid’s days. The girl will often produce a deck of cards and do little card tricks and magic tricks for the kids. However, there are a couple negatives for her personality as well. Thalia is very persistent. She doesn’t like to be proven wrong, and will often argue that she’s right, until she finally realizes she isn’t. She can also be rather impulsive and thoughtless in certain situations. This can more often than not lead her into trouble. More than she already is. If you are ever so unlucky as to meet the girl in the red trench coat, you should run. Thalia is, and has to be, a completely different girl in her completely different outfit. Thalia hates to be like this, but has no choice. In meeting her like this, you find yourself with a very deceitful and untrustworthy girl. She’s aggressive when she’s caught, but otherwise sneaky and sly. Thalia is also rather sadistic when it comes to being like this, ruthless and detached. She doesn’t care what the price is that others have to pay, or rather so it would seem on the outside. Thalia is all about getting what needs to be done, done. By whatever means necessary. A regular cold-hearted person. Just like everyone else around her. In the ways of love, Thalia is completely clueless. She doesn’t really understand what it means exactly to have feelings for someone, but there is one person she feels closer to than anyone else. That person is Aitou. However, based on the way that she is forced to be, and everything that she has to do, Thalia doesn’t believe she deserves to have a special person in her life. So, she tends to be evasive when it comes to romance, or anything that would get her any closer to Aitou. Her greatest wish is to one day have this thing called freedom, because then she could simply be herself, and be able to enjoy her life, instead of fear it. For some general facts, Thalia is of course a bender. This doesn’t mean that she supports Korra and the United Forces however. Thalia honestly holds a grudge against the both of them. The fact that the avatar, the person who is responsible for making Republic City the center of all balance, hasn’t done anything about the gang Thalia is trapped in, has made her rather doubtful of the balance keeping skills of both parties. When it comes to Amon, Thalia doesn’t approve of him, and will fight against him any way she can, unless it puts her alongside Korra. Thalia’s only loyalty, as a result, falls on her team for pro-bending, and the gang she’s trapped in. Because of this, she has a rather screwed up view on the world. As for a last general thing, Thalia is completely terrified of letting people get too close to her. In her normal clothing, and her pro-bender way, Thalia is a lot different than the other way you might find her. Thalia is a bit taller than her age’s average height. Standing at 5 foot 5 inches, she’s a bit taller than most twenty year olds, but also shorter than some as well. As for weight, with a build and mussels like hers, Thalia weights a bit more than the average. Her total weight is 135 pounds. Thalia’s body is very toned, and muscular in the way that female can be, and still be attractive. Her skin is a light tanned color, showing her like for sitting out in the sunlight. Her cheeks are lightly blushed, and she always seems to have a sad smile on her face. The expression in her eyes is always somewhere between guarded and depressed, with a hint of an actual smile. Thalia’s hair is always a bit unruly, pitch black in color, and hanging in her face. She always lets it down and leaves it blowing in the wind. Her bangs tend to fall into her face, covering her eyes, and this mostly leads to her either leaving them there or blowing them out of the way again. Thalia’s eyes, as a fire bender, are a soft red. In the night time they almost seem a little more pink than red, but in the morning sun they are a brighter golden red. Thalia’s face has a soft appearance and her lips are a light pink color. Her eyes are a bit more sunken in her face, and this gives her a tired and more fragile look. 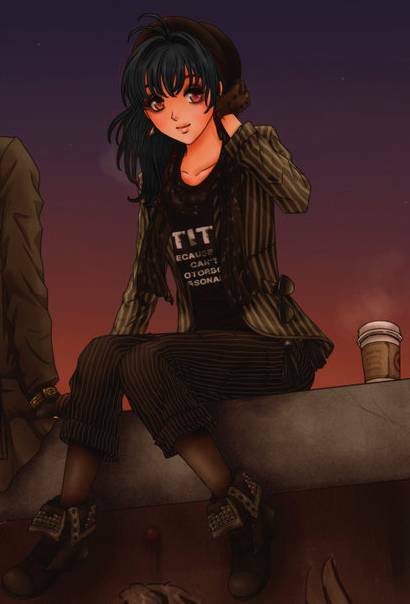 As for clothing, Thalia dresses in an old black cap. She wears a black tank top with white lettering that spells out words too worn to make out. An old grey and black scarf is wrapped loosely around her neck, and hangs down long enough to her abs. Over the tank top, Thalia has on a grey and white pin stripped jacket. Hanging out of the pocket on the left side, is a pair of sunglasses that she hardly ever puts on. On her hands, she wears black gloves that only reach her wrists, and have little buttons on the tops. For pants, Thalia wears knee high stockings and black capree pants with grey stripes on them. You could say her favorite pattern was stripes. The stockings are the color of her skin, and give her legs are a more tanned appearance. On her feet, Thalia has dark black boots with the tongue and tops folded down, as is the style, to show off grey lining and designs. When Thalia is around with the triple threat triad, she is a completely different person. Her eye color, hair color, and her height and weight stay the same, however, how she appears in clothing, and expression, are very different. The appearance on her face is a lot more dangerous. Her eyes are fiery, and hold a more murderous look. Behind them, is a bit more of a depressed look, but you can’t notice it when she’s looking at you like she’s going to kill her. Her smirk is a bit more dangerous than the soft smile that her normal appearance would wear. As for clothing, Thalia’s appearance gives her a more deadly look. For a shirt, she is dressed in a red and black stripped corset without sleeves. The front is strung together at the top, and the bottom keeps her entire mid-drift covered. Around her neck she wears a black fabric necklace with a lot of metal chains that hang down off it. A key and a lock are the only two charms on the chains. For bottoms, Thalia wears a red and orange plaid skirt, not exactly matching, but something a lot more comfortable to wear. A black belt rounds the top of it. Bellow that, Thalia has black stockings that connect up, and are frilled at the tops that end on her mid-thigh. 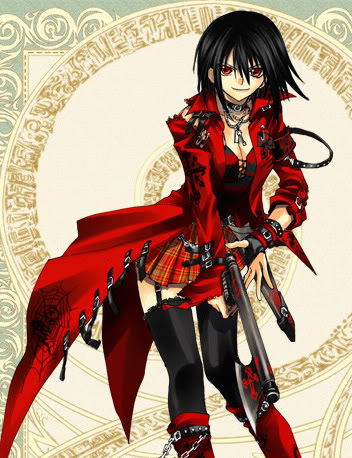 For shoes, she has bright red boots with black belts on the tops and chains hanging off those. The boots are knee length and have an inch of a heel on them. Finally to top off her appearance, Thalia wears a red and black trench coat, that has assorted black buckles and belts and different patterns and designs. And, on her hands, she wears finger-less black gloves and different black and red bracelets on her left arm. IF NON-BENDER, YOU GET ONE FREE WEAPON. History: The night had been stormy, cold and miserable. That was how the weather had been the night that Thalia’s parents had met. Her father, a Firebender, had been an information broker for the triple threat triad. He had a job in the police department of Republic City, and he fished out information to the triad in order to have himself be put out of danger. Her mother was a simple woman, as well as a nonbender. She was a florist that owned a small shop in town. When they’d gotten together, her father had left the triad in order to kept his past away from harming his future and present. That wasn't how it was going to go, but for now, for Thalia’s parents, life was peaceful. When Thalia’s mother had told her father about the expectant baby, he knew that the money they made wasn't going to be enough. He also didn't want to have his family be put in harm’s way by his past history with the triad. Thalia’s father had told the force that he was leaving their service. He quit his job and got a new one as a chef for a small restaurant in the city. The pay was better, and it gave him and his wife a better standard of living. Soon the baby was born, a girl who the parents named Thalia. As Thalia grew, she developed a love for flowers. At the age of two, she was allowed to explore the flower shop that her mother worked at. She would often be found playing with different flower arrangements that had to be taken off of display for wilted petals or leaves. Once, her mother had found her pulling over different vases on top of herself, and that was when she’d started to have to be kept in play pen while her mother worked. The only good thing was that the store was their own, and it made it simple to be able to still have time for her daughter. Life was going well. Gang activity in the city was common, but it was always somewhere else. No one ever expected anything to happen to the shops in this part of town. It was a quiet neighborhood, and everyone was also so kind to each other, so when the past of Thalia’s father showed up, no one was prepared. They demanded that they would be keeping these shops safe, for a cut of the profits. Thalia’s family made just enough to keep themselves afloat, and having to pay to the triad was going to be too much. When they came to the flower shop and demanded the payment, Thalia’s mother didn't have it. Instead, the bender lit the shop up, and took a four year old Thalia from the mother who was pushed down. Her father at work a few blocks away. Thalia was too little to ever remember that part of her life, and now she was going to be raised by the triad. She was cared for by a couple of benders in the gang. She was taught the usual stuff kids were, as well as how to be a gang member. However, Thalia had already started to be her own person, and she often didn't follow the rules. She was developing her own personality and the big boss wasn't having it. One thing she was forbidden to do, as well as one rule she was sure to always follow, never leave the headquarters and wonder the city. Thalia had her own room, and she always told to stay there if someone ever came to the doors. Thalia was smart though, she’d learned different ways to get around, unseen. When Thalia turned five, which may or may not have been the actual day of her birth, being they told her that her birthday was the day she was dropped off there, and no one knew anything about where she’d come from before, her curiosity got the best of her. One night, when the rest of the members were either out or sleeping, the little girl had managed to slip out into the night. With black hair tied back into a pony tail, and nothing but a soft pink shirt that acted as a dress and a pair of yellow boots, she ventured into the city. It wasn't two hours later one of the members found her in the park and took her back to house. In the morning, she would have to have a talk with the boss. When morning came, they took Thalia from her room to the main office where the gang’s boss sat. He spent an hour scolding her and making her pledge her allegiance to the gang. When the boss was finally finishing up, someone else was escorted in. With a quick glance behind her, Thalia would have her first meeting with the only boy who was around her age in this entire gang. Aitou. He was there, she figured, to be introduced, being that she’d never seen him around the headquarters before. She realized that she was hoping she’d finally have a friend. When Thalia was dismissed, she gave a slight bow, and as she pasted the boy, headed back to her room, she flashed him a friendly smile, trying to hide the red puffiness of her eyes. Through childhood angst, to training sessions, Thalia and Aitou grew close. Well into their late teens, the two were paired together with a water bender, though one they had never met before, for the next Triple Threat Triad team of three. This is when Aitou and Thalia formed a plan though, to work together to rid themselves of having to do all the gang affiliated activity. The two joined a pro bending team to make the money they were supposed to get from gang work. The third water bender, Ralph, was a few years older than them, and had not a friendly bone in his body. He was perfectly okay with having Thalia and Aitou do all the work, so he easily was fooled into how the two made the money. Only on rare occasions did the three have to work together on something, and that was when they regrettably did have to do gang crimes. But for the most part, the two were free to pro bend, make money, and live in the closest thing there was to light in the crime world. When Amon threatened to take over the city, life in the gang got really hard. Thalia and Aitou were out of a way to make money, and by such, forced to do the crimes they both hated so much. The equalists were also a threat they now had to deal with. Amon had chosen to attack the Triad and capture the leaders. When this happened, chaos erupted within. There was a mad power struggle, and Thalia and her partners were doing all they could to make the higher ups happy and stay out of the way. Once Amon was taken down though, things started to settle again. During the whole Civil War in the Water Tribes, business started to get good again. There were plenty of people they could sell too, and those who request help to get back at a neighbor or friend for supporting the wrong team. Thalia didn't like those requests, and would often duck out and face the punishment then go through with it. She'd almost always find a way to have an excuse... Except when she couldn't, and she'd hate herself for it later. This was another short lived experience though, as Harmonic Convergence came and went. Now, spirits roam around Republic City, and the Spirit Jungle sits in the middle. Crime and problems run a muck in this city, but everything has returned to normal for the most part. Thalia and Aitou are once again free to try to pro-bend for money, and do other stupid things to earn it, instead of steal it. So long as they don't get caught, the two of them can continue to try to buy their freedom. Code of Approval: Red Panda’s of Death shall plague your nightmares…or snuggle you! RP Sample: So there once was a man named Tim. He decided to jump off a bridge. Only the water level was down, and he fell on his crown, and now Tim is longer in this world. How sad. Source: I Am Me, and that is all there is to it. Approved babygirl =^.^= Great profile as always!